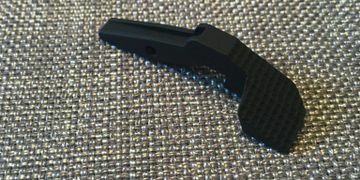 Left-handed shooters “quick” bolt release for the Kel-Tec RDB. This is a VERY limited run of bolt releases for the Kel-Tec RDB Bullpup rifle for LEFT handed shooters. We do not have pictures yet but will shortly, they are being picked up today from anodizing and will be available for shipping Friday. These mount on the RIGHT hand side of the rifle, require NO modifications to your rifle, just two screws to the left and right of the existing bolt release, our base plate goes on with those two screws, then one more screw to attach the release pivot lever to the base plate, all with blue loctite recommended (loctite not included), and you’re out shooting. All parts to install, minus loctite, are included in your purchase. These add fantastic dexterity to fast mag reloads, no charging of the handle, just dump empty mag, insert new mag, tap the release after mag install, and back to shooting. Due to the limited run, there are no discounts available on this item. Price includes shipping. Thanks for your business!